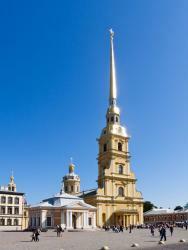 The cathedral is situated in the center of the Peter and Paul Fortress. First, a small wooden church was built in the cent­er of the unfinished fortress on the 29th of June in 1703. This church was dedicated to the Apostles Peter and Paul. Then in 1712 the construction of a stone building in place of a wooden church began. The Cathedral of St. Peter and St. Paul was built in 1733 by the Italian architect Domenico Tresini. St. Peter and Paul Cathedral was erected as the main ca­thedral in the city. Tresini came to work in Russia at the invitation of Peter I. The architectural style of this cathedral is a combination of different traditions and European styles. The cathedral is 122m high. It was the tallest building in Russia at the beginning of the 18th century. It was the tallest building in St. Petersburg before the television tower was erected. The building is dominated by a tall bell tower with a spire. The spire is crowned with a weather-vane in the shape of an angel carrying a cross. The interior of the cathedral is very interesting. The design was made by Ivan Zarudny. The iconostasis was carved in 1720 by two Moscow masters. Their names were Trifon Ivanov and Ivan Telega. The iconostasis is made of gilded wood. All the Russian tsars beginning from Peter I and their spouses were buried in the Cathedral of St. Peter and St. Paul. Peter I was buried there in 1725. There are no tombs of Peter II and Ivan VI. Ivan VI was 12 month old when he was imprisoned in the Schlissel­burg fortress and was killed in 1764 by his guards at the attempt to liberate him. He spent 23 years in prison. At present the cathedral is open for visitors as a museum.And services are held in the cathedral.